One problem within esoteric research is the belief that clairvoyant faculties are needed, but that is not necessary within most areas if there are enough leads through accessible sources, it’s a question about eyes that have learned to see. The following methods are useful both with and without clairvoyant faculties, as deeper detective work may be needed to find where to look. A prerequisite is that we need to get the necessary understanding within the area we want to research, an intuitive recognition of the person. All physical activity tells about the spiritual reality behind it. It gives us knowledge we need to create the necessary hypothesis for the project. Many things we may think of as small details may contain vital information. Steiner leaves many small curious details in his texts that are difficult to interpret, but they are puzzle pieces that connects to other puzzle pieces. Let’s take reincarnations research. It’s complicated as a great understanding of the souls involved is necessary if it should not be a guessing game. Many try without having the patience to make the necessary research, so they design a guessing system instead. 💫We create puzzle pieces with every bit of archetypal information we have on the incarnating soul. 💫Then we look for candidates matching this profile and we look for logical dependencies between the incarnations. 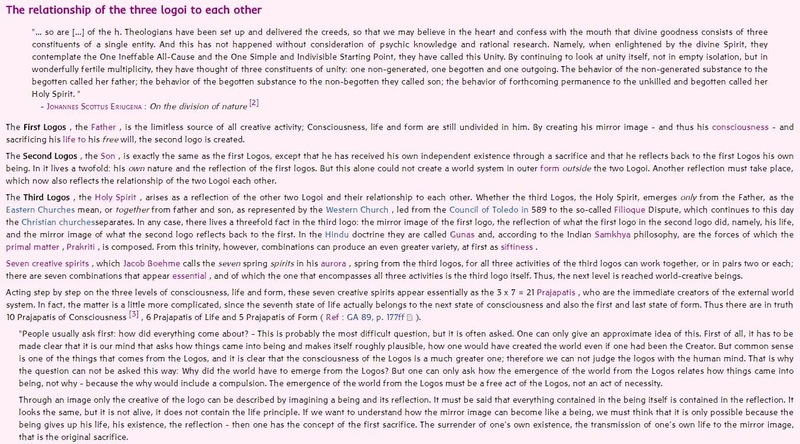 This is like putting puzzle pieces together, a picture is needed to make the theory possible. We are looking for the underlying patterns, morphological forms. This is of course only possible if we have to do with persons who have a large footprint in history, like Arjuna, Gilgamesh, Zarathustra, Hiram Abiff, Socrates, Alexander the Great, Hypatia, Joan of Arc or Christian Rosenkreutz. If we are looking at our own incarnations I think we need to have special knowledge about our own previous incarnation to get an intuitive understanding of our archetype and mission. 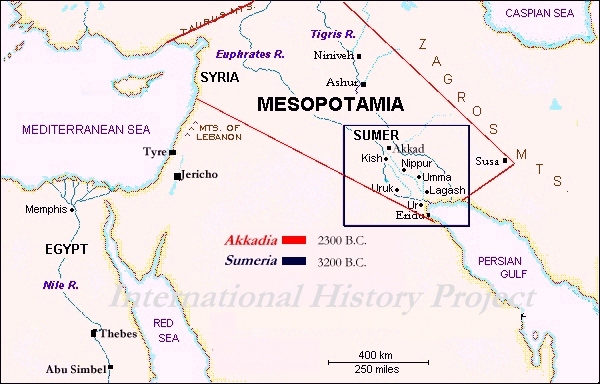 With this information we may find even earlier incarnations. Through Contemplative Inquiry we may find a starting point, if the spiritual world agree in your quest. It’s also possible, in the state of half-sleep, to ask if we have lived in a given year. The response can be given as Yes, No or a YesNo, for death or birth year. YesNo sounds like Yes and No is said at the same time, not as following each other. We shall not easily find our way into the innermost nature of karmic connections if we do not pay attention — with the eye of the soul, of course — to the particular mannerisms of an individual. Believe me, for the study of karma it is just as important to be interested in a gesture of the hand as in some great spiritual talent. It is just as important to be able to observe — from the spiritual side (astral body and ego) — how a man sits down on a chair as to observe, let us say, how he discharges his moral obligations. If a man is given to frowning, to knitting his brow, this may be just as important as whether he is virtuous or the reverse. Generally speaking, it is not, as you know, very easy to pay real attention to bodily peculiarities. They are there and we must learn to observe them naturally without wounding our fellow-men — as we certainly shall do if we observe merely for observation’s sake. That must never be. Everything must arise entirely of itself. When, however, we have trained our powers of attention and perception, individual peculiarities do show themselves in every human being, peculiarities which may be accounted trifling but are of paramount importance in connection with the study of karma. 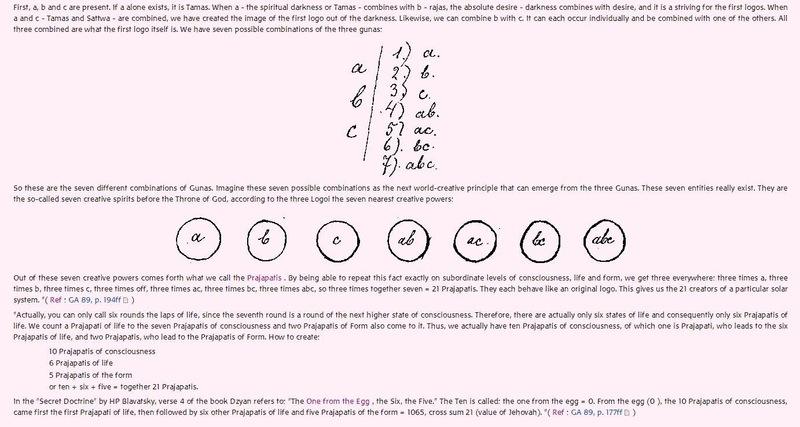 A really penetrating observation of human beings in respect of their karmic connections is possible only when we can discern these significant peculiarities. From Karmic Relationships: Esoteric Studies – Volume I.
Christ and Maria flanked by the Esoteric Christianity represented by Sct. John, and Exoteric Christianity, represented by the Church. Madonna and Child (or The Ansidei Altarpiece) painted by Raphael. In the center column of this picture by Raphael we have Christ as the Son of Man, known as Anthropos the second Adam, and Maria also known as Sophia. 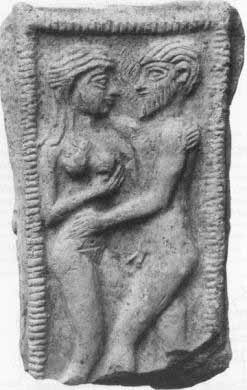 Together they are known as Anthroposophia by the Anthroposophists. 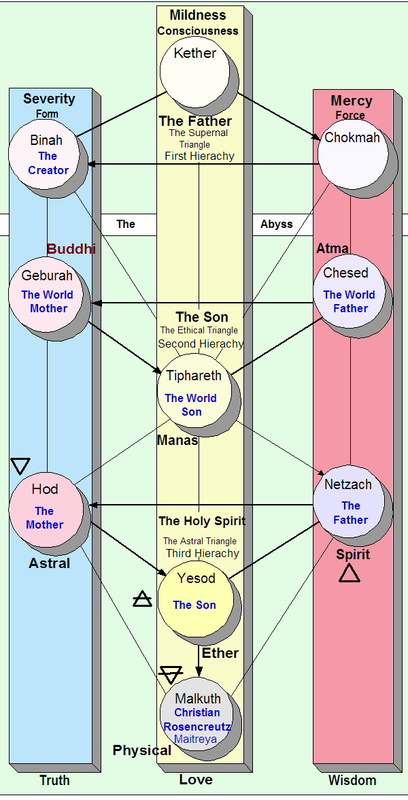 They follow here the setup of the Kabbalah Tree of Life, Where the Exoteric Christianity is placed to the Right representing Sct. Peter and Salomon, and Esoteric Christianity are placed to the Left representing Sct. John, and Hiram Abiff the builder of Salomon’s Temple, and Christian Rosencreutz. Se The Temple Legend and The Masonic Legend for the legends behind Rosicrucianism and Masonry. Jesus told him, “Feed my sheep. Truly, I tell you with certainty, when you were young, you would fasten your belt and go wherever you liked. But when you get old, you will stretch out your hands, and someone else will fasten your belt and take you where you don’t want to go.” Now he said this to show by what kind of death he would glorify God. What it meant was that John would die physically, but not mentally, when he incarnated again he would remember, from life to life, who he was. Text taken from International Standard Version. The Rosicrucian Cross is the symbol for the Spiritual Stream started by Christian Rosenkreuz known under the name Rosicrucianism. The Rosicrucian Cross combines the seven Red Roses, Lotus Flowers or Chakra’s with the Cross we have seen in the Caduceus Staff or the Tree of Life of the Kabbalah. When the Roses Bloom on the cross, the Chakras has been opened. The twelve rays are the influence of the Zodiac as the roses symbolize the planets. Imagine you see before you a black cross. Let this black cross be for you a symbol for the baser elements that have been cast out of man’s impulses and passions; and at the point where the beams of the cross meet, picture to yourself seven resplendent bright red roses arranged in a circle. Let these roses symbolize for you a blood that is the expression of passions and impulses that have undergone purification. He who tears the roses from the black cross and has nothing left but the black cross, would fall into the clutches of Ahriman. The black cross in itself represents life when it strives to embrace inanimate matter. Also, if one were to separate the cross from the roses, keeping only the latter, one would nor find the proper thing. For the roses, separate from the cross, tend to elevate us to a life of selfish striving toward the spiritual, but not to a life in which we reveal the spirit in a material world. Not the cross alone, not the roses alone, but the roses on the cross, the cross carrying the roses: That is our proper symbol. One of the entrances to the temple was decorated with Roses. The Rose connects to Shekinah (Sophia) who has been titled ‘The Rose of the World’, Rosamundi. The Cross is still used in Masonic Symbolism. The Rose of Sophia is actually the Holy Grail and Jesus Christ the Hostie. The rose is a yonic symbol associated with generation, fecundity, and purity. The fact that flowers blossom by unfolding has caused them to be chosen as symbolic of spiritual unfoldment. The red color of the rose refers to the blood of Christ, and the golden heart concealed within the midst of the flower corresponds to the spiritual gold concealed within the human nature. The number of its petals being ten is also a subtle reminder of the perfect Pythagorean number. The rose symbolizes the heart, and the heart has always been accepted by Christians as emblematic of the virtues of love and compassion, as well as of the nature of Christ – the personification of these virtues. The rose as a religious emblem is of great antiquity. It was accepted by the Greeks as the symbol of the sunrise, or of the coming of dawn. 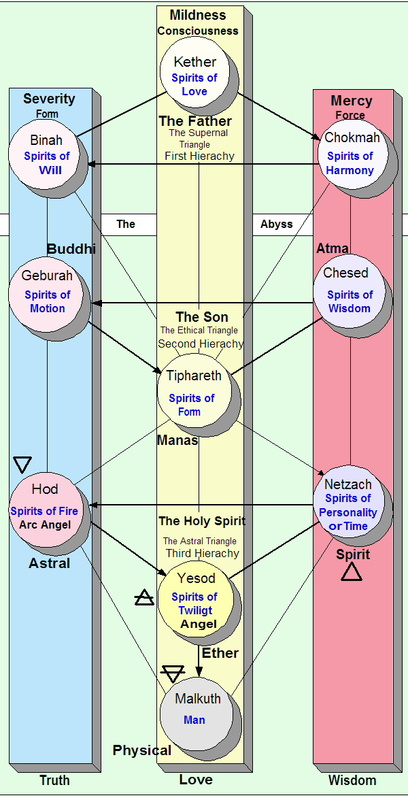 First row are Kether, second row are Chokmah and Binah, third row are Chesed, Geburah, and Tiphareth, and fourth row are Netzach, Hod, Yesod, and Malkuth. Many see Kabbalah as an intellectual game without any relation to the real world, nothing could be more wrong! It’s a description of man, and what is involved in his development. Each Sephira is, of course, a spiritual principle, but for all spiritual principles there are also living beings, and further more, each being is also part of a larger being. 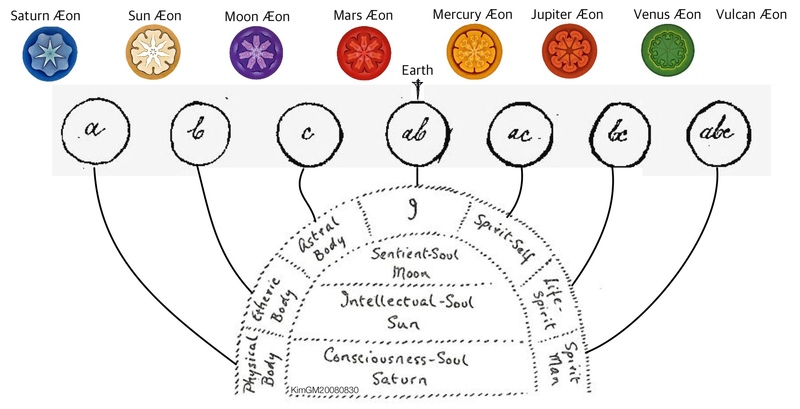 The Tree of Life seen from a Rosicrucian viewpoint: The seven Roses represents the seven lower Sephirots (or Chakras), where the three upper Sephirots are above man, on the other side of the Abyss. 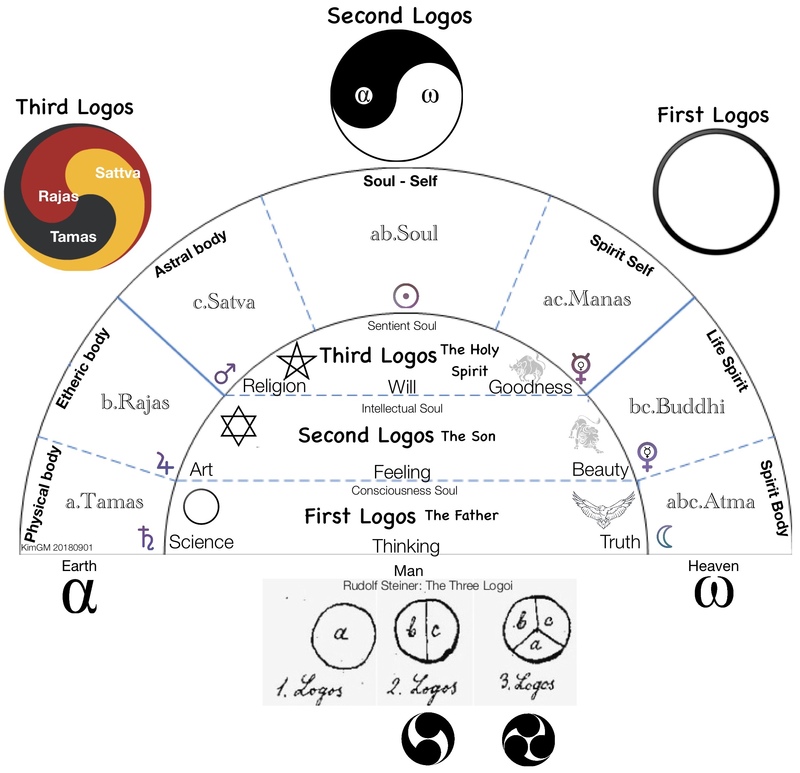 The three Sephirots of the second Triangle, below the Abyss, are Called “The World Father” or Atma, “The World Mother” or Buddhi, and “The World Son” or Manas by the Rosicrucian’s, which are the higher layers of Man. This can also be seen in this table. The Ten Sephira corresponds to the Spirit of Love, Harmony, Will, Wisdom, Motion, Form, Personality or Time, Fire, Twilight, and Man.